Attempt to critique Neil Young’s "Honour the Treaties" Tour backfiring, says Aboriginal group. The controversial, pro-oil group Ethical Oil is in PR damage control mode after publishing a social media message that many Aboriginal people saw as racist. On Tuesday, Ethical Oil posted a tweet inviting its nearly 5,000 followers to view a link to a Neil Young video on the Sun News Network website criticizing the rock star’s “Honour the Treaties” tour. The same link leads to several videos of Ezra Levant – the chairman of Ethical Oil -- who often uses fiery language on air to describe his environmental and aboriginal foes. Young’s tour is in concert with Athabasca Chipewyan First Nation, which sees recently federally approved oil sands expansion on its territory as a violation of its treaty rights. “It’s racist. They should have had more tact than that for being an organization with ‘ethical’ in their name," Athabasca Chipewyan First Nation spokeswoman Eriel Deranger told the Vancouver Observer. "It’s a cheap shot." Ethical Oil communications staffer Amanda Achtman says she posted the "careless" tweet, and apologized. “The phrase was intended to point out Neil Young's ignorance about Canadian Indian affairs,” said Achtman from Toronto. “As sometimes happens with on-the-fly tweeting, the phrase could be taken out of context or misinterpreted, so it was deleted,” she wrote in an e-mail to the Vancouver Observer. Consequently, the offensive hashtag #IgnorantIndian is also fast becoming a trending hashtag in Canada, according to the Trendsmap Canada twitter account. 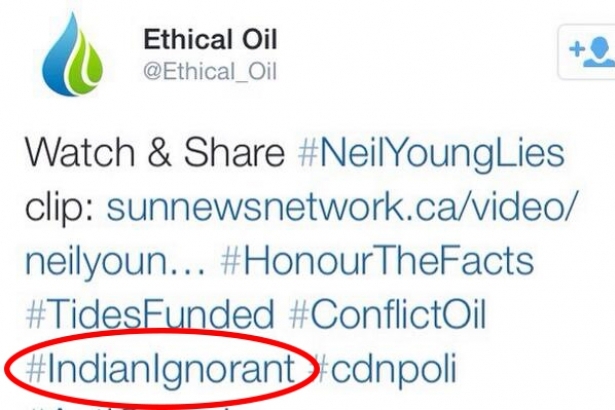 At the time the tweet was posted, Ethical Oil had just launched its campaign designed to discredit Neil Young. The “NeilYoungLies” twitter account had re-tweeted the controversial #IgnorantIndian message. Deranger says she can only speculate if Ethical Oil wrote the offensive tweet on purpose to draw up attention for its new anti-Neil-Young efforts. In December, the Harper government approved Shell Canada’s Jackpine oil sands expansion project, outraging Athabasca Chipewyan leaders, who believed they were still in negotiations about the project. 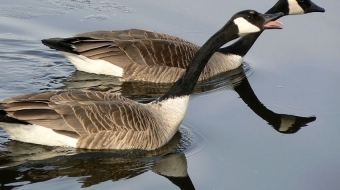 Many are concerned the project will destroy wetlands and wildlife. 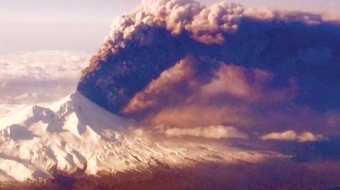 The project is expected to pump 100,000 barrels of bitumen oil per day. Athabasca Chipewyan Chief Allan Adam has an online petition asking the federal government to reverse its decision on the Jackpine oil sands expansion. Nearly 50,000 Canadians have signed it in support. "The government and Big Oil CEOs are slamming Neil Young for speaking out on the Tar Sands and the poison they are sending to my people," Chief Adam stated on the website.